Economical IP68 protected sensor with stainless steel 316L housing and Ceramic strain gauge sensing diaphragm for measuring liquid depth pressure or the pressure in a submerged pipe or vessel. Electrical Connection: Submersible integral cable with a PUR, PVC or FEP jacket. The IMCL low cost water proof liquid level sensor is designed for end user or OEM applications which require a low cost piezometer with a durable design and a medium grade accuracy performance. Three different choices of housing, seals and cable are possible with the IMCL to provide 27 different configurations to suit a wide range of liquid media compatibility. Measure hydrostatic pressure from from 0 to 10 mWC (33 ftWC) up to 0 to 100 mWC (330 ftWc) and convert reading to a millivolt, current or voltage signal output. The Ceramic diaphragm has a high chemical resistance to media such as leachate, and the housing can be upgraded to Duplex stainless steel if necessary for extra material protection. A PUR coated cable is fitted as standard, but for additional chemical protection an FEP coated cable can be supplied. A high pressure water tight seal protects the signal conditioning electronics from leaking down to depths up to 100 metres (328 feet). The electronics are also protected from lightning induced voltage surges to reduce the risk of damage at exposed locations such as landfill sites and reservoirs. 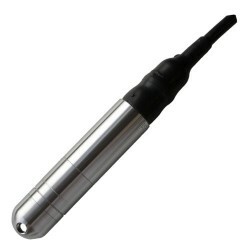 The electrical signal of IMCL low cost IP68 hydrostatic level sensor can be a low power consumption millivolt output for connection to battery powered telemetry monitoring system or logging instrumentation. For process applications such as water treatment, landfill sites or tank storage a 4-20mA can be specified for transmitting a level reading from one side of a site to another through analogue signal cable wires. Monitor the level of runoff rainwater captured by a stormwater drainage well. I am looking for a set of submersible pressure sensors with a 0-5Vdc voltage output for measuring contents of fresh water tanks with a head of up to 10 meters. The low cost IMCL low cost submersible pressure sensor looks suitable, since I do not need high accuracy, better than 1% full scale would be acceptable. I would require a cable of 30 meters, presumably I can simply splice on additional signal cable once the cable run is under cover? Yes, you can splice on extra cable as long as it is not submerged, but bear in mind the cable is vented to provide an atmosphere reference for the sensor, so we would suggest using a breathable and dry enclosure such as a vented junction box to join the ends of each cable together. I’m looking for a submersible water level transmitter for a hydro-power upstream and downstream level measurement purpose for a water head not exceeding 38 metres. I’m attempting to fit this sensor, and I need to connect it to an existing electrical cable. I see that there is a plastic tube included in the cable assembly attached to the sensor, and this is in the way. I can’t see anything in the datasheet about the plastic tube. The plastic tube is a vent tube, and is there to allow the reverse side of the sensor diaphragm to freely vent to outside air. You will need to ensure that the tube has continual access to atmospheric air pressure, otherwise if it is sealed in a box, the sensor reading will vary with changes in barometric pressure. If you are joining cables then you will need a vented junction box such as the KL1. I am working on a water pipeline project that requires a ratiometric pressure sensor which can be powered by a 5 V dc supply, has a measuring range of 0- 10 bar, and the enclosed rating must be IP68. The IMCL has the option for a 0.5 to 4.5Vdc ratiometric output with a 5 volt supply. You can use the 1/4 BSP male fitting to attach the sensor to the pipeline and it is waterproof to a depth of 100 metres. Which outputs have the least power consumption? How is the IMCL submersible pressure sensor compensated for atmospheric pressure changes? The cable contains a vent tube as standard which brings atmospheric pressure to rear side of the pressure sensing diaphragm, and thus compensates the hydrostatic + atmospheric pressure present on the front side by effectively cancelling out the effects of atmospheric pressure. I need a submersible pressure transmitter that is no more than 25mm in diameter to monitor the level of water above a submersible pump providing the water supply to a carwash from a 30 metre deep bore. The IMCL has an outside diameter of 25mm and is waterproof to a depth of up to 100m, so it will be adequately protected for lowering to the bottom of a 30m bore to measure the head of water above the pump. 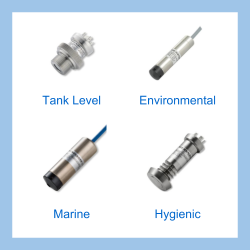 Please select the options you require for the IMCL Low Cost Submersible Pressure Sensor in your application and request a quote. Send us your enquiry for IMCL Low Cost Submersible Pressure Sensor to get assistance with this product type.